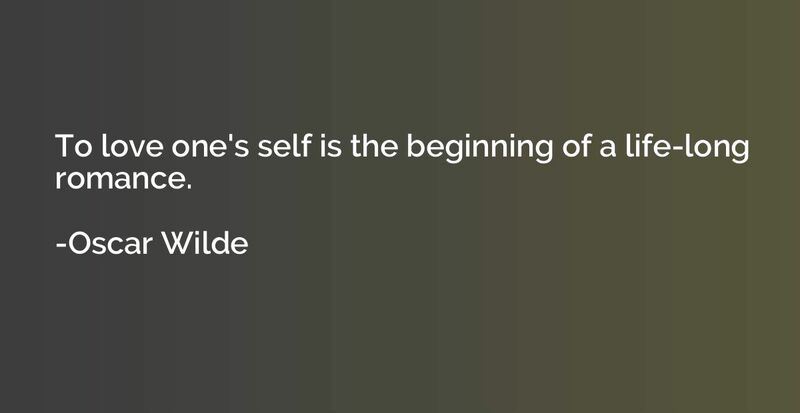 To love one's self is the beginning of a life-long romance. 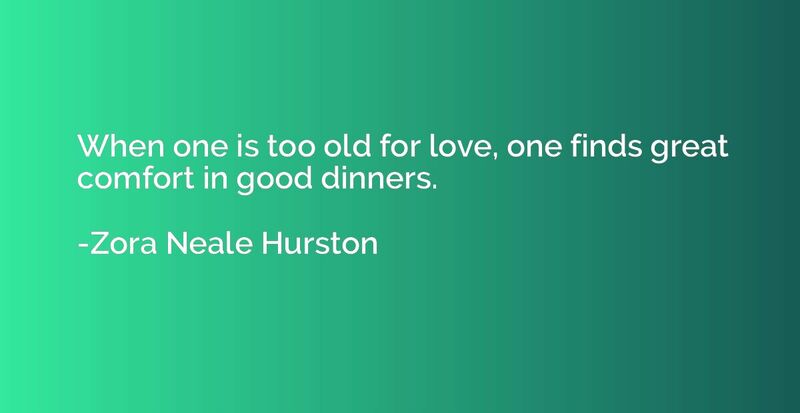 When one is too old for love, one finds great comfort in good dinners. 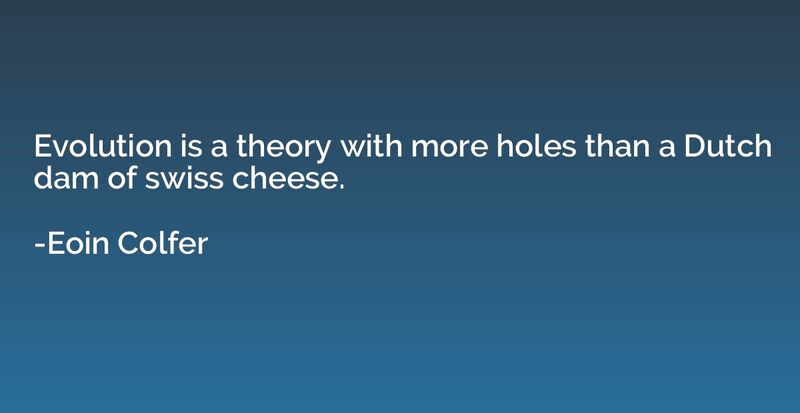 Evolution is a theory with more holes than a Dutch dam of swiss cheese. 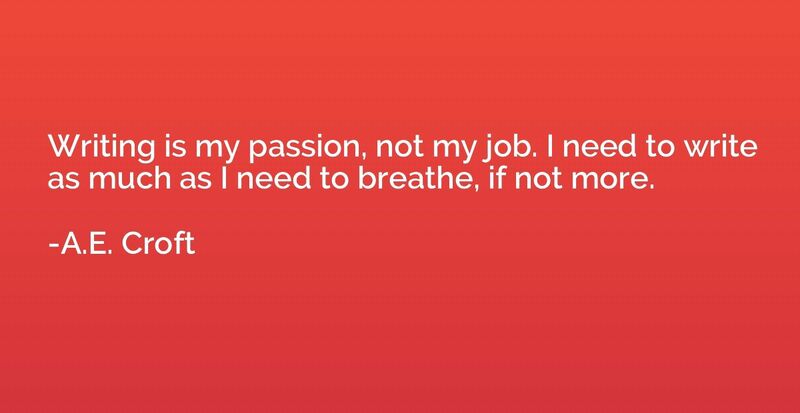 Writing is my passion, not my job. 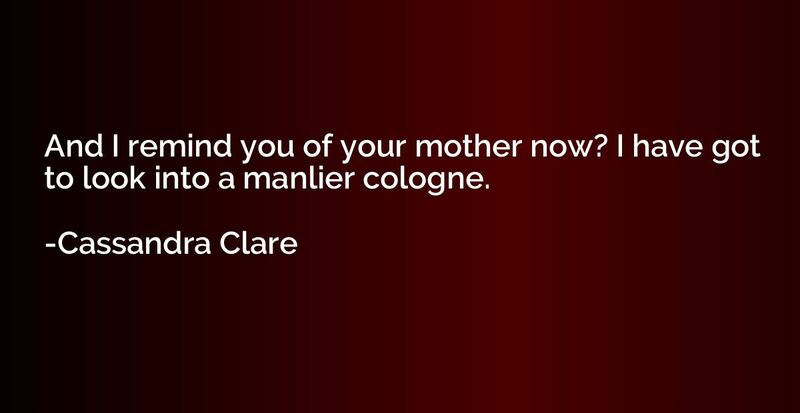 I need to write as much as I need to breathe, if not more. 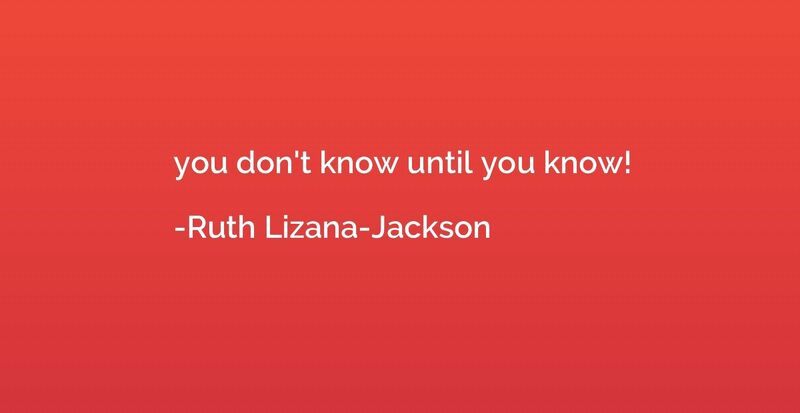 you don't know until you know! 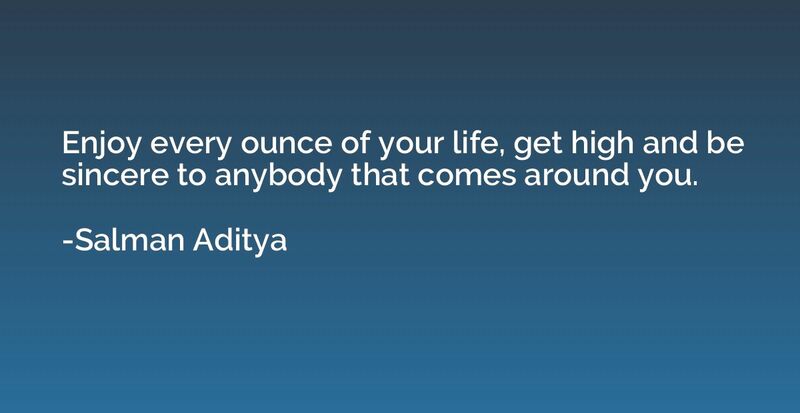 Enjoy every ounce of your life, get high and be sincere to anybody that comes around you. 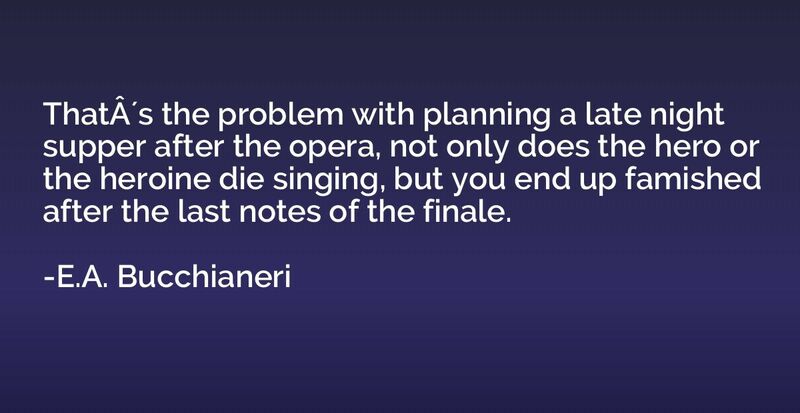 That´s the problem with planning a late night supper after the opera, not only does the hero or the heroine die singing, but you end up famished after the last notes of the finale. 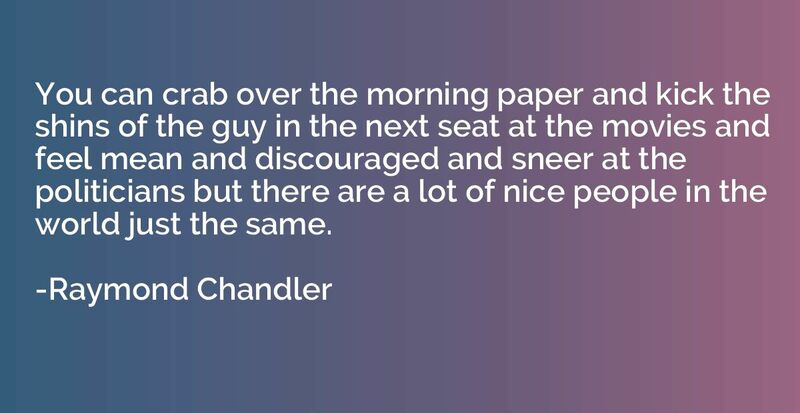 You can crab over the morning paper and kick the shins of the guy in the next seat at the movies and feel mean and discouraged and sneer at the politicians but there are a lot of nice people in the world just the same. 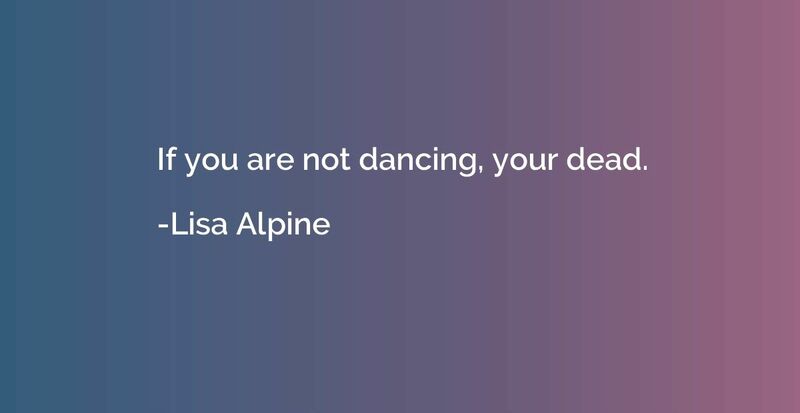 If you are not dancing, your dead. 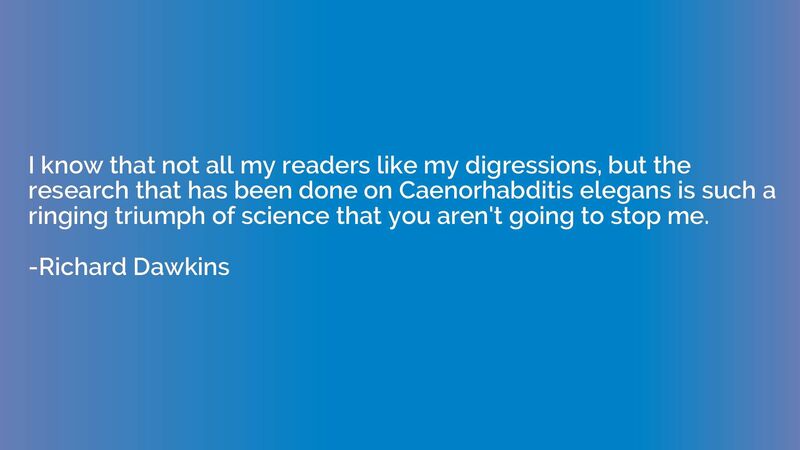 I know that not all my readers like my digressions, but the research that has been done on Caenorhabditis elegans is such a ringing triumph of science that you aren't going to stop me. 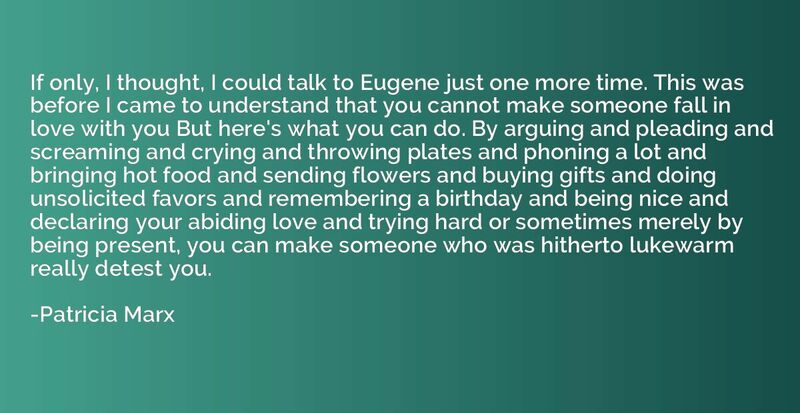 If only, I thought, I could talk to Eugene just one more time. This was before I came to understand that you cannot make someone fall in love with you But here's what you can do. By arguing and pleading and screaming and crying and throwing plates and phoning a lot and bringing hot food and sending flowers and buying gifts and doing unsolicited favors and remembering a birthday and being nice and declaring your abiding love and trying hard or sometimes merely by being present, you can make someone who was hitherto lukewarm really detest you. 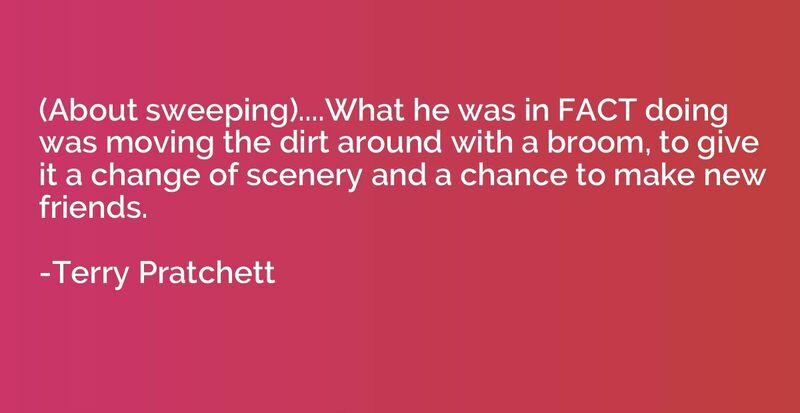 (About sweeping)....What he was in FACT doing was moving the dirt around with a broom, to give it a change of scenery and a chance to make new friends. 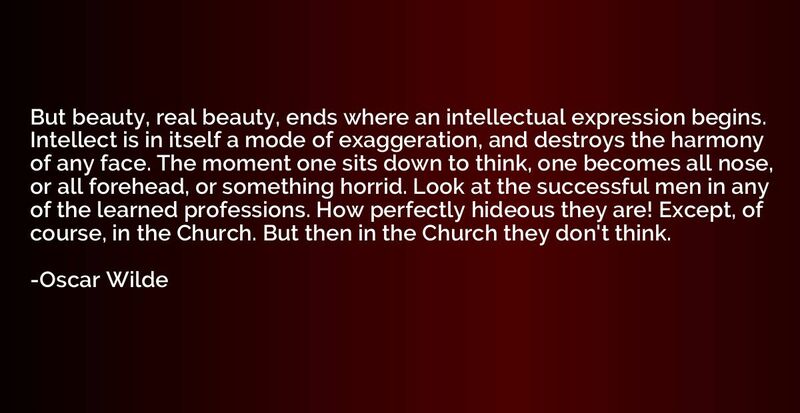 But beauty, real beauty, ends where an intellectual expression begins. 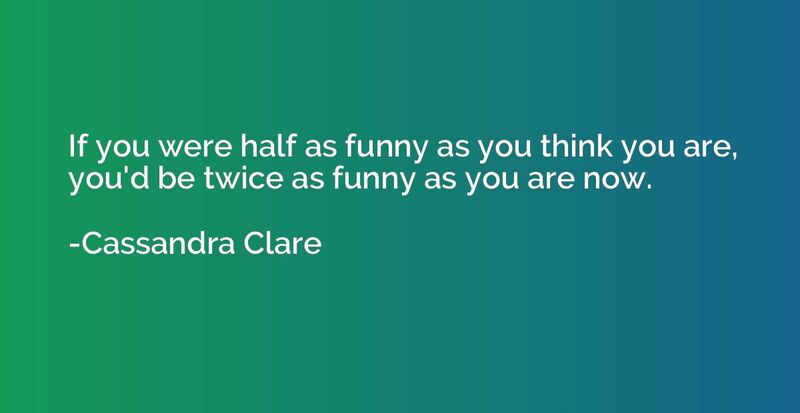 Intellect is in itself a mode of exaggeration, and destroys the harmony of any face. The moment one sits down to think, one becomes all nose, or all forehead, or something horrid. Look at the successful men in any of the learned professions. How perfectly hideous they are! Except, of course, in the Church. But then in the Church they don't think. 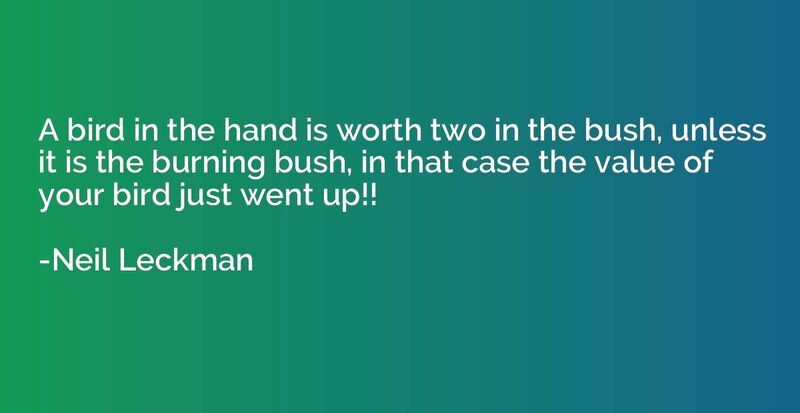 A bird in the hand is worth two in the bush, unless it is the burning bush, in that case the value of your bird just went up!! [Mrs. Allen was] never satisfied with the day unless she spent the chief of it by the side of Mrs. Thorpe, in what they called conversation, but in which there was scarcely ever any exchange of opinion, and not often any resemblance of subject, for Mrs. Thorpe talked chiefly of her children, and Mrs. Allen of her gowns. 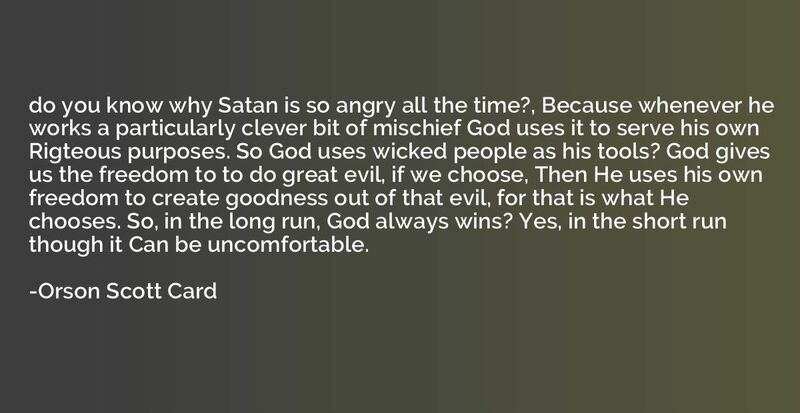 do you know why Satan is so angry all the time?, Because whenever he works a particularly clever bit of mischief God uses it to serve his own Rigteous purposes. So God uses wicked people as his tools? God gives us the freedom to to do great evil, if we choose, Then He uses his own freedom to create goodness out of that evil, for that is what He chooses. So, in the long run, God always wins? 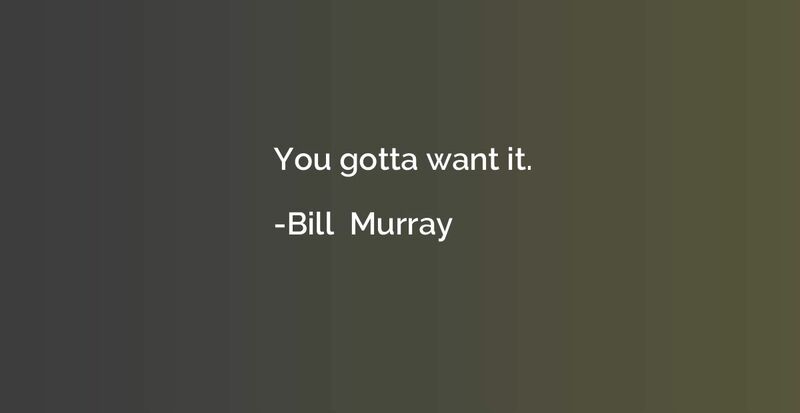 Yes, in the short run though it Can be uncomfortable.